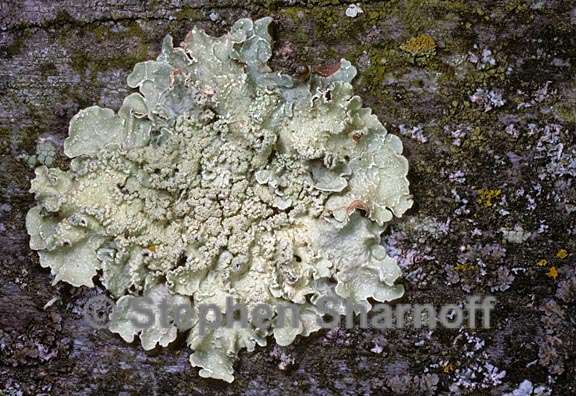 Thallus: foliose, weakly appressed to tightly adnate, 4-10(-13) cm in diam., lobate lobes: sublinear to sub-irregular, 2-6 (-9) mm wide, plane, contiguous upper surface: greenish yellow to yellow-green, turning a dark buff with age in the herbarium, smooth to weakly wrinkled and rugose, rarely weakly ridged-reticulate, sometimes with white maculae; rare specimens with a few marginal laciniae pseudocyphellae: white, large (up to 1 mm), round to elongated and branched, generally common and abundant soredia: white, farinose to granular, in round, laminal soralia arising from pseudocyphellae and sometimes coalescing; lobe margins may also support soralia, only occasionally forming reflexed, "crescent-shaped" soralia medulla: white with a continuous algal layer lower surface: black to dark chestnut brown, sometimes paler toward the margin, smooth to finely wrinkled; rhizines: simple, rarely branching, short, concolorous with the lower surface, usually absent in a zone along the margins Apothecia: rare, laminal, sessile to substipitate, 2-6 mm in diam., pseudocyphellate and becoming sorediate; disc: deeply concave, dark rusty-brown; margin: concolorous with the thallus asci: Lecanora-type, 8-spored ascospores: hyaline, simple, ovoid to ellipsoid, 8-13 x 5-7 µm Pycnidia: black, rare or absent conidia: bifusiform or appearing filiform, 6-10 µm long Spot tests: upper cortex K+ yellowish, KC-, C-, P-; medulla C+ red, KC+ red, K-, P- Secondary metabolites: upper cortex with usnic acid (minor) and rarely atranorin (trace); medulla with lecanoric acid (major), + 5-chlorolecanoric acid (minor or trace). Substrate and ecology: on rocks (basalt, gneiss, granite, rhyolite, sandstone and rarely limestone), bark of hardwoods (Fouquieria, Prunus, Quercus, Robinia), bark and wood of conifers (Juniperus, Picea, Pinus, Pseudotsuga) from 120-850 m in southern California or 1250-3140 m in other Sonoran areas World distribution: widespread in temperate and boreal areas as well as higher elevations in the tropics in North and South America, Africa, Europe and India Sonoran distribution: mountains of Arizona, southern California, including the Channel Islands, Baja California and Baja California Sur, Chihuahua, Sinaloa and Sonora. Notes: As pointed out by Hale (1980), some specimens of F. flaventior intergrade with F. soredica. However, the combination of abundant large pseudocyphellae, laminal soralia, and the infrequent formation of marginal "crescent-shaped" soralia is usually diagnostic. Specimens collected from bark are more likely to appear "intermediate" than those occurring on rocks.